You made it possible to stand with Sanaa and her communities earlier this year, convening 9 conversations on religion and democracy. You made it possible to stand with them again this month, with a rapid response gathering of many leaders to uplift values of faith at this moment and plan next steps together: the holy work of standing with neighbors who are under attack and being people of hope. Your involvement is needed. You can “connect the hope” with an investment in the circle of faith communities who act together. 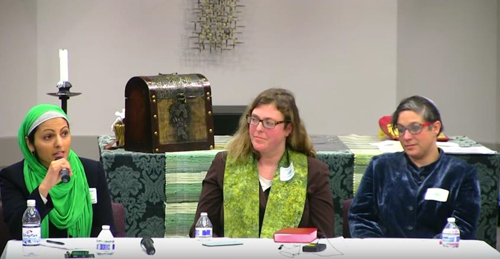 Active network of faith leaders: Christians, interfaith partners, and allies who meet and create work groups to carry forth the holy work of refuge, protection, and advocacy. You support the many steps to convene, follow up, and build involvement in their brave work. Voices of Faith in the Public Square: Voices ring through City Council Chambers in Bellevue and SeaTac, Renton and Seattle, calling for housing solutions. Victories in each city protected and increased housing for 5,000 people in just the past 3 months. “Remember those ministers?” we’ve heard Council members say a week later. You make it possible. Prayer and Vigil: Gatherings to keep our spirits focused on the great work we are given, to be beloved community for our neighbors. Thanks to you, the light of God shines into hearts, dispelling shadows of fear. Thanks to you, we are ready. This is the moment that the Church Council was created for. Help us respond. Without you, there is no central hub, no website to share news, no staff & lead volunteers to attend a dozen organizing meetings each week. Fewer trusted partners for Sanaa and her community to turn to. A circle of leaders stepped forward with gifts of $5,000 to close 2016 strong and be sure we are ready to do even more next year. Won’t you join them? Thank you. What a good thing it is to be people of hope in this time.